Where Will Your XC40 Momentum Take You? 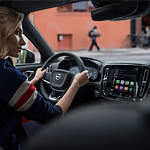 We here at Volvo Cars Hilton Head understand how important it is to have the right features for your SUV. With style, technology, and safety in mind, we’d like to introduce the Volvo XC40 Momentum. Increased visibility both day and night is a feature of the XC40’s unique lighting design. Shaped like Thor’s Hammer, it provides a unique look with LED lamps that are brighter and use less power. The rest of your exterior can be accented in bright chrome along with a wide range of color options that can match your style so that you can have a unique look. These are just some of the features you can enjoy with this popular luxury compact SUV. Visit us in Bluffton, where you can see these different styles and take an XC40 Momentum out for a test drive.